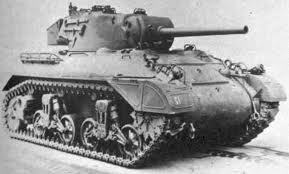 TThe US T7 Light Tank/M7 Medium Tank was a US Army prototype developed as a future replacement for the M3 & M5 light tanks. Original prototypes were built by Rock Island Arsenal. These were developed in to the T7E2 and featured a cast hull and turret design. The pilot vehicle used the turret ring of the Canadian RAM tank, which meant the vehicle could be up gunned to the 75mm main gun. The vehicle proved unpopular as a light tank and the original order of 3000 vehicles was cancelled 1943.